All 12 pipe ranks are individually registered under pneumatic control from a 16 channel lock/cancel register unit. One of the 16 is a general reset/clear, another connects a tremulant oscillator, leaving 2 spares. The essential feature of the memory function is that you set up what ranks to use with short impulse commands, and these settings are then kept until another command is given. Meanwhile you can change settings manually. See the cross section drawing beside. The rails a, b, and c are divided into two sections holding 8 output amplifier valves each, while the other rails extend over all 16 positions. The 3 kPa air supply is present in channels along the whole unit, marked P, in the c and g rails. The memory unit is rails d and f, each with a row of 16 pouches. Pouches in an upper/lower pair act on a corresponding lever e that is hinged using a 0.1 mm brass sheet spring. The lever carries a small neodymium magnet that attracts to the closer one of the iron adjustment screws in d and f, above and below (blue). This attraction makes the memory function, such that levers stay in the position set. At rest all pouches in d and f are pressurized, so they give little net force on levers e. When a magnet in g is energized, then its corresponding pouch in f is vented, and the d pouch will press the lever down. This 'on' position opens a valve hole in rail d. This in turn operates the amplifier valve in a-b-c-d which will vent its reg output, tubed to its row of register pouches in a chest. One of the 16 positions in the unit is denoted as 'cancel', 'clear', or 'reset'. It is like the others, except its d pouch is replaced by a spring. It is the output of this amplifier valve that feeds the clr input. When you vent the single clr input, then all pouches in d are evacuated, allowing the pouches in f to push levers up to the 'off' position. But, if at the same time a set command is given to one or more magnets, then their f pouches are also vented and nothing will happen to those levers. They will then stay their earlier position, on or off. 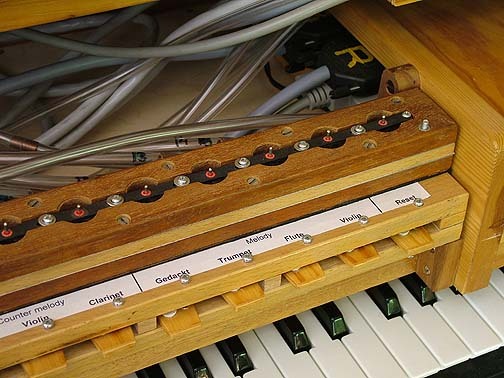 This photo shows the controls shelf slightly pulled out on its guides, and below it the MIDI keyboard that is one of the alternate means of control. Extreme right is the box holding the MIDI decoder and patchboard. This is where all the cables for the various chest (note) magnets originate. Behind the register unit is a worm's nest. Beside the cables there are PVC tubes going from the register unit to the pouch valve rows that enable the various pipe ranks.